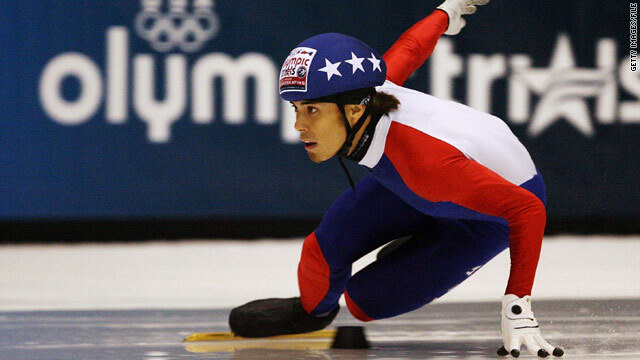 Apolo Anton Ohno has won five medals in his Olympics career, which started at Salt Lake City in 2002. (CNN) -- For a short-track speed skater, a career is often proportionate to the size of the track on which he competes. American Apolo Anton Ohno is an exception to that rule, as he prepares for his third Olympic Games. "Usually athletes in short track go to one Olympics, and you never see them again ... maybe two Olympic Games. Those who medal are far and few in between. Usually you see guys [who are] back-to-back medallists in games and then they're done. "Our sport is that intense and requires so much training and determination." Ohno said. He burst onto the international scene as a 17-year old, winning a world junior championship. Two years later, he won gold in Salt Lake City, Utah, at the 2002 Olympics. As the years have passed, Ohno has done the same to his competition. He often sees former rivals now standing in the coaching box, as he takes on their protégés. "There's been four generations of Koreans, three generations of Canadians, three generations of Chinese. I've been lucky enough to evolve with the sport and help revolutionize this sport to get it to where it is today," he said. Ohno has arguably been America's face of the Winter Olympics for nearly a decade. If he wins a medal in Vancouver, he'll become the most decorated U.S. male athlete in Winter Olympic history, but he says he tries not to think about that too much. Two more and he passes speed skater Bonnie Blair, who won six medals. "It's pretty amazing to even have my name mentioned in the same sentence among some of those other great speed skaters, Bonnie Blair and Eric Heiden, but that's not what truly drives me," he said. "I want to go there prepared and leave the games with no regrets ... and just put on the best show that I can." Sports Illustrated Olympics writer Brian Cazeneuve says that while Ohno is not the favorite in any of his four events, he certainly is among the contenders in his individual races. And that's thanks to an unrivaled work ethic. "If you ask any of his teammates, they'll tell you that they've never seen anybody work harder than he does," Cazeneuve said. "And some of his younger teammates will say specifically that they realize how hard they have to work just by watching him." The Vancouver Games will be a homecoming, of sorts, for Ohno, who first learned to lace up his skates in the Pacific Northwest. Growing up in Seattle, Washington, his father used to drive him to Vancouver to teach him how to skate. He plans on having a lot of family and friends in attendance during the Olympics. That's not been the only homecoming for Ohno. He moved to Salt Lake City to train for this year's games. He's hoping the path that his career has taken is a good sign. "That full circle, hopefully there's some symbolism there, I believe there is. I don't know what it means but hopefully it's much bigger than my brain or thought process can handle. " Ohno is no longer known as just a speed skater. He made a name for himself in front of a whole new audience in 2007 by winning the popular reality show "Dancing With the Stars." While his newfound fame has brought Ohno some new fans, he hopes its done more than that. "I think I really brought the Olympic Games to the spotlight for many viewers and many people that would have never watched the Olympic Games and hopefully they're gonna watch in Vancouver, B.C." Ohno isn't ready to admit that Vancouver will be his final Olympic Games, saying only that he's taking it one event at a time. Whenever the day does come that Ohno skates away, he hopes to use his Olympic fame to help others. He's started his own supplement company and would like to be an ambassador for healthy living. "The Olympic Games is a lot for people, and it's treated me very, very well, in terms of just giving me the opportunities to stand on a platform and have a voice now with a microphone and speak to people. There are a lot of opportunities out there post-games, and I'd like to definitely explore them. " Cazeneuve says it's amazing to see Ohno still skating at a high level considering his celebrity. "Given everything he has done off the ice and given all of his off-ice opportunities, it's remarkable that he is as motivated as he is to do well as he does in the area that brought him his fame," he said.